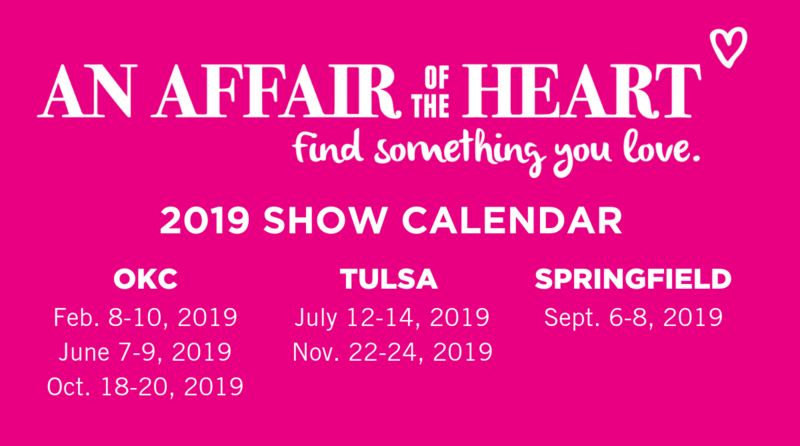 An Affair of the Heart has been hosting shows for over 30 years in Oklahoma and recently added new shows in Arkansas and Missouri. An Affair of the Heart has been under the same ownership since its inception and maintains a favorable relationship with its vendors by providing well-managed and strongly promoted shows. An Affair of the Heart is a juried show accepting artists, craftsmen, boutique owners and small retailers though preference is given to handmade vendors. We are always looking to add to the An Affair of the Heart family though we typically have a waiting list for our Oklahoma shows. If you’re interested in exhibiting at one of our shows, please select the city of interest below and follow the application process. PLEASE NOTE: NO MAKEUP, DIET OR FOOD SUPPLEMENTS, PARTY-BASED OR MULTI-LEVEL MARKETING PRODUCTS ARE ALLOWED. BOOTH FEES VARY BY CITY. An Affair of the Heart is the largest and longest running show of its kind in Oklahoma. While the Oklahoma shows often have a vendor waiting list, you can still be a part of the legacy by exhibiting at our new shows.